The production of wool cloth was the powerhouse of Florentine industry, its biggest employer and the motor behind the city’s medieval population growth. It was produced both for an internal market and for export across Europe and the Mediterranean. You only need to look at the attention given to fine clothing in Renaissance paintings to see how important textiles were to the city’s sense of its own identity. In the late fifteenth century, Giovanni’s time, wool was in fact going through quite a serious dip – there were about 80 merchant workshops running, most near Orsanmichele; the cluster of workshops that had existed south of the Arno had more or less vanished. Meanwhile, silk production (eg broccade, taffeta, velvet) was on the rise. Nonetheless, wool, principally quality perpignano dyed with woad or madder, remained vital. Florence was connected up by the wool industry. Using a “putting out” system, most stages of production were undertaken by specialist artisans outside the centre: dyeing near Santa Croce, on the river; weaving, usually done at home, in several enclaves in the periphery. The merchant’s workshop was the hub. As Giovanni says, the fleeces were prepared here, and semi-skilled day labourers like him – as many as 1,000 of them – streamed in from the outskirts parishes every day. The Wool Guild was the guild of the merchant-manufacturers, not the workers. It was a key civic institution, in charge of the city’s biggest and longest-running public works project, the Cathedral. Communal government had evolved out of the guilds (seven major, 14 minor) and you had to be a member to be eligible for public office. When Wool Guild sottoposti (subordinates) like Giovanni – the Ciompi –staged their revolt in 1378, what they essentially wanted, and briefly achieved, was a place at the guild table. 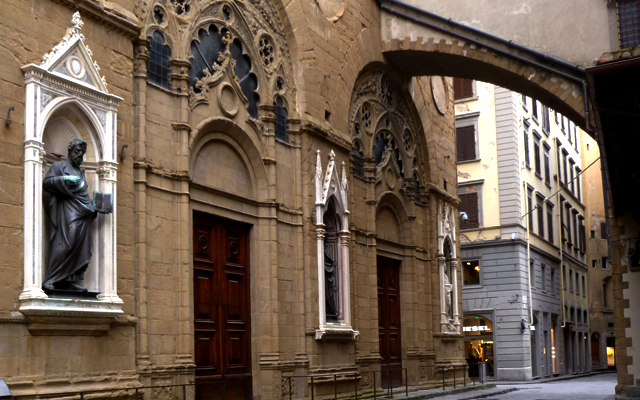 Thus when Giovanni stands in front of the guild church of Orsanmichele he feels a sense of exclusion. As he says, however, permission was granted for wool workers to incorporate in the form of confraternities in the later fifteenth century. While merchants and the government could see the social benefits confraternities provided, they remained ambivalent about allowing workers to associate – and indeed these lay brotherhoods did occasionally turn into hotbeds of labour organisation. As for a potenza or festive kingdom of wool workers, which Giovanni dreams about setting up outside Orsanmichele, this is exactly what happened in the early sixteenth century. Tellingly, they called themselves the “republic of the Woolbeaters”. Richard Trexler, ‘Neighbors and Comrades: The Revolutionaries of Florence, 1378’, Social Analysis, 14 (1983), 54-106.